Are you looking for some fantastic team shorts that actually make a statement? Not the same ones everyone else is wearing, but shorts that really stand out? Then let Shop4teams help you customize your team’s look. As a leading provider of girls athletic shorts, we have designed custom athletic uniforms for teams all over the country. 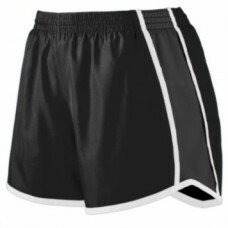 Now, we’re ready to help customize the shorts for you and your team. Size chart Brushed back 90% polyester/10% spandex knit * Soft brushed back poly/spandex ..
100% polyester wicking knit * Wicks moisture away from the body * Girls fit * Pad print label * Cove..
100% polyester propelit micromesh * Wicks moisture away from the body * Pad print label * Girls fit .. Size chart A-line body Single-needle bound ne..
100% polyester with Essortex moisture management performance * Contrast piping detailing * Covered e.. Size chart 84% polyester/16% spandex knit * Inserts are roller printed to reduce chance of dye.. Size chart Shell is 100% polyester micropoly *Inserts are 100% polyester mesh *Lining is 100% polyes.. Size chart Shell is 100% polyester micropoly * Inserts are 100% polyester mesh * Lining is 100% poly.. Size chart . Dry-Excel Perform lightweight micro-denier woven fabric has a smooth polyester sur.. Size chart All over Montage print on Dry-Excel™ lightweight micro-denier woven fabric has.. Size chart 90% polyester/10% spandex knit. Odor resistant. Wicks moisture away from the b.. Size chart Outer layer of 100% polyester tricot mesh. Inner layer of 100% polyester tricot lining. G.. Size chart Heavyweight 50% polyester/50% cotton jersey knit. Girls' fit. Elastic waistband. V-notch .. Size chart Style # 1400 Adult: S-M-L-XL-2XL Style # 1300 Youth: XS-S-M-L 92% French Terry Cotton / 8.. Size chart Style # 1450-ZG Adult: S-M-L-XL-2XL Style # 1350-ZG Youth: XS-S-M-L 80% Polyester / 20% S..